In the blustery northwest corner of Cumbria, wind farms are becoming part of the landscape. 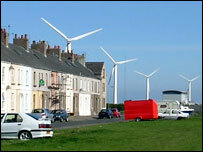 North of Workington, wind turbines stride for miles along the unlovely stretch of industrialised coastline, looming over shops and houses. "I hated the sight of them at first," says a resident of Senhouse Street in Siddick, where the turbine blades seem to graze the rooftops. "But then I got used to them, and now I hardly notice them at all." The British Wind Energy Association (BWEA) reckons this sort of phlegmatic attitude is widespread. In a survey released this week, it suggests that 70% of the population would welcome a wind farm in their area. But the industry's apparent confidence is only skin-deep; the BWEA is girding up for a publicity campaign to counter a well-organised and growing protest movement, comprising an unlikely coalition of ecologists, economists, rural conservatives and worried homeowners. 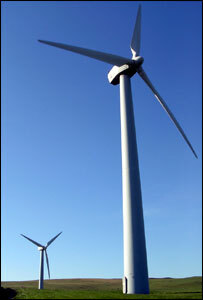 The anti-wind farm campaign is capable of generating great heat at the local level. Ric Outhwaite, head of planning at Allerdale Borough Council, which includes Workington, says he has already received more than 1,000 letters of protest to each of the two applications he is currently considering. The antis oppose wind farms on a raft of counts. Environmentalists worry about the effect on wildlife, in particular on the bird population. "We're just starting to see the return of rare species - the lapwing, the skylark, bats and hares," says Avril Hemsley-Rose, who is campaigning against a proposed wind farm at Bolton Low Houses, 20 miles inland from Workington. "How can any kind of industrial development be good for them?" Rural dwellers worry about noise - turbines emit a low but persistent thrumming - and the effect on tourism. The Bolton Low Houses proposal, for three 75-metre turbines, promises to dominate the view from Catlands Hill, a local beauty-spot. While a landowner receives generous payment for playing host to a windfarm, usually £8,000-10,000 per turbine per year, neighbours get nothing. Economists have their own reasons for disliking wind power. The inputs may be free, but wind generation is relatively inefficient: variable wind speeds mean that most turbines operate at only about one-third capacity. A recent study from the Royal Academy of Engineering calculated that onshore wind farming cost more than twice as much per kilowatt-hour as most fossil fuels. As a result, the wind business is reliant on subsidy, which provides close to three-quarters of the revenue for a typical new development. Wind farms sell electricity to the grid like any other producer, but earn most of their cash by selling so-called renewable obligation certificates (ROCs) to fossil-fuel generators. These ROCs allow traditional generators that are likely to miss their renewables-use targets - in other words, all of them - to purchase eco-friendly capacity without re-tooling their own plants. This form of subsidy costs the British taxpayer £500m a year, roughly half of all subsidies for renewable energy. The wind power industry calls most of this superstitious rubbish. Study after study, groans Chris Tomlinson of the BWEA, has failed to turn up serious evidence of environmental damage from wind farms. "Hardly any birds fly into windfarms; millions fly into car windscreens, but no one campaigns against them." Wind farms are also more efficient than they may at first appear: the usual 30% capacity use was actually more like 50% in gusty 2003. That figure puts the wind sector pretty close to the fossil fuel competition. And while no one denies the industry relies on subsidies, so too do many other areas of the power industry. The apparently low generation costs of gas, coal and nuclear do not even begin to factor in the potentially astronomical costs of decomissioning defunct plants. Wind farms, by contrast, are easily tidied away. "When our turbines give out, we can just cart them away," says Annette Heslop, a board member of Baywind, which operates two wind farms in southwest Cumbria. "We re-seed the grass, and a week later you'd never know they'd been there." If, ultimately, this sparring is inconclusive, it is easier to point an accusing finger at government policy. Last year, the UK Government threw its weight behind a huge expansion of wind power, with the aim of generating 10% of the country's electricity from renewable sources by 2010. And this August, it loosened planning requirements for wind farms, hoping to speed up the process - currently at least a year - needed to approve a project. But while almost everyone prefers offshore wind farms, which are both less objectionable and vastly more productive, the ROC subsidy regime makes them uneconomic. Onshore and offshore projects attract the same subsidies, but offshore development is much more expensive. As a result, the UK now has just two offshore windfarms, with a total of 32 turbines; to achieve the 2010 renewables target, the BWEA calculates it needs at least 1,500 offshore turbines. The government's attempts to ginger up planning have also annoyed local authorities. The new guidance sets renewable energy targets for municipalities, and generally advises them to view wind-power projects favourably. As far as Ric Outhwaite at Allerdale Council is concerned, that undermines his authority to direct planning. "We would like to be able to designate areas where wind farms can be built, but we can't do that" he says. "The new advice makes it very difficult to achieve the usual balance between public opinion and the rights of developers." Things might be different if wind power promised an influx of jobs to west Cumbria, a region of high unemployment. But it doesn't. Although the government predicts the industry could sustain up to 35,000 jobs by 2020, there is no reason why those workers need be in the same areas as the wind farms, which are operated remotely and maintained sparingly. In Cumbria, the site of many of Britain's forays into nuclear technology, there is considerable resentment at having wind farms foisted on them. The latest regional plan evisages a tenfold increase in wind capacity in Cumbria; neighbouring Lancashire, which currently has as much capacity as Cumbria, is asked only for a 50% increase. "Some might say we've done enough in providing electricity for the rest of the UK," says Mr Outhwaite. Luckily, a less clunky model for the industry is gaining ground. Baywind is a cooperative, owned by 1,300 members, who have put in between £300 and £20,000, and many of whom live in the surrounding area. Since its launch in 1996, Baywind has remained profitable - with a gross rate of return of about 6% - and has set aside a portion of its income for educational work and grants for energy saving. Unlike some multinational wind-power firms, many of which have become chippy under the barrage of criticism, Baywind makes a point of being cosily community-focused: neighbourhood schoolchildren, for example, were asked to come up with names for its six Harlock Hill turbines. Last year, Baywind set up a management arm, Energy4All, to encourage the development of cooperatives around Britain and overseas. So far, it has four projects ready to go, and others in the pipeline, including deals in Devon, Wales and Ireland. The turbines outside your window don't look so nasty, it seems, when they're paying you a healthy rate of interest.